Who can hire our wheelchair accessible cars? Our wheelchair accessible cars are available for private use when not needed for the Pembrokeshire Country Car Service. Cars are usually available in the evenings and at the weekends. Availability is limited during the week, but please do ask. The wheelchair - user or disabled person must be a Pembrokeshire resident. Drivers must be over 21 years old and have held a full drivers licence for at least two years. Yes, your nominated driver will need to be available for a short familiarisation with the vehicle and training in the wheelchair access and restraint equipment before taking the vehicle out for the first time. Once trained, your nominated driver will be covered by our insurance policy. What can the cars be used for? There are no restrictions on journey purpose. The service is ideal for people that don’t have their own wheelchair accessible car but who have an occasional need for this facility. 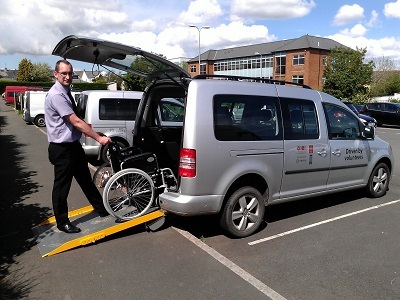 We have a range of cars, which accommodate one wheelchair user, plus up to three passengers as well as the driver. (Wheelchairs can be up to 74cm wide, with 136cm headroom and 126cm tray length). The accessible cars have an electric winch and ramp access at the rear. Large wheelchair? More than one wheelchair user? A large group? We can put you in touch with your local community minibus group, who have wheelchair accessible minibuses available. Register here to use our Minibus Match scheme which offers access to a range of accessible minibuses.